Original Vintage piece from family estate........This is a stunning vintage large brooch with huge, faceted AB crystals, and marquis shaped pearls. Beautifully designed in a graduated stacked round, with prong settings and well crafted structure. Signed by Coro. 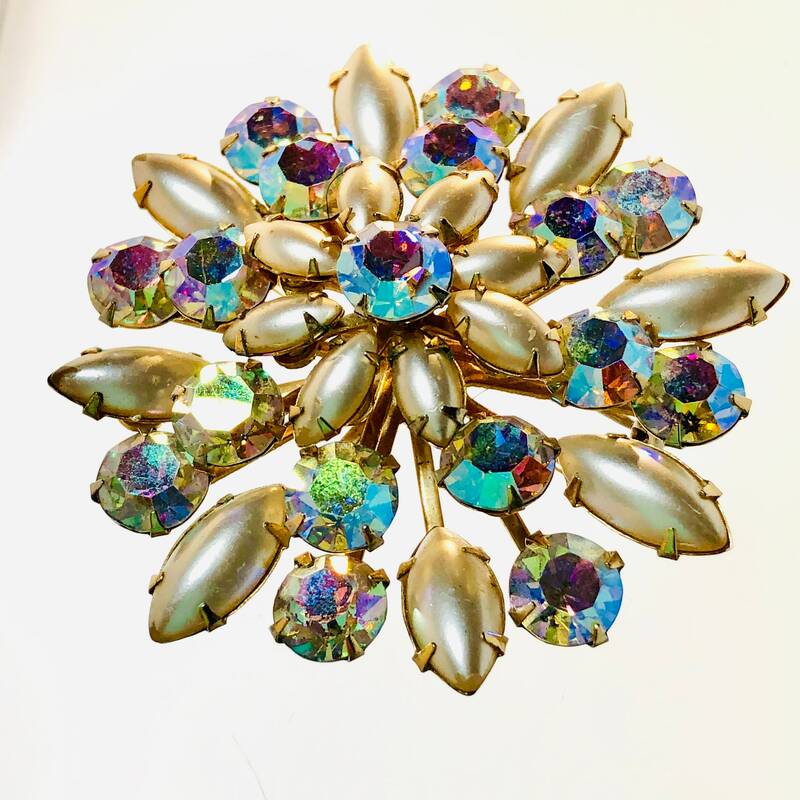 A classic brooch, to be worn year round, from lapels, to sleeves, on a clutch, or to hold a scarf in place. It would make a wonderful gift or a nice addition to your collection. Pictures are used as part of the item description. Vintage, antique and pre-owned items may show signs of age appropriate wear, so please look carefully at pictures using the zoom feature and feel free to ask me any questions . I will mention any defects that I find, but I'm only human and may miss something. If you want to view the opening of the last Estate box of Jewelry, go to this youtube video I made....give you an idea of what I have and what it looks like when I first open up a box.....I have 20 plus that have not been opened yet! Recvd this darling little ladybug pin in 2 days! It was exactly as described and I couldn’t be happier! I will order from this site again. Pleased with purchase! As described! Pretty mint condition bracelet, nice Etsy Seller. We understand that sometimes items do not meet the expectations of the buyers. WE are happy to accept returns. We only ask that you contact us first. We will refund the purchase price, once the item returns to us, in original condition....We will only refund the shipping costs in any cse where we are at fault. We ship first class anywhere in the U.S.A....and insure all items. We ship internationally and use international postal service with insurance. All items are used and from our estate. Over 40 lbs of jewelry was left to us, and we raise our special need grand kids. WE will always give you personal attention. Just ask and we will add a card and a special gift box, for no additional cost. We measure all of our items, I use a Mandrel for rings and have noticed differences from one mandrel to another. Allow a half size in either direction, to be sure. I use inches, normally when measuring, feel free to ask about mm and cm.